Welcome to the JVNP 2.0 Update featuring a JV request courtesy of fellow JVNP 2.0 Partner Aaron Sustar (Spin Rewriter 8.0 article spinner launch affiliate program JV invite), Buzz Builders (Bryan Winters – Dual Squeeze launch, Eben Pagan – Virtual Coach, Matthew Woodward – Insanse SEO Training pre-launches) and More … in Today’s cash in on the Spin Rewriter birthday bash edition. You can never have too much quality content when it comes to marketing, right? You can think of the upcoming 8.0 launch (Oct 18th) as its official birthday #6 celebration. 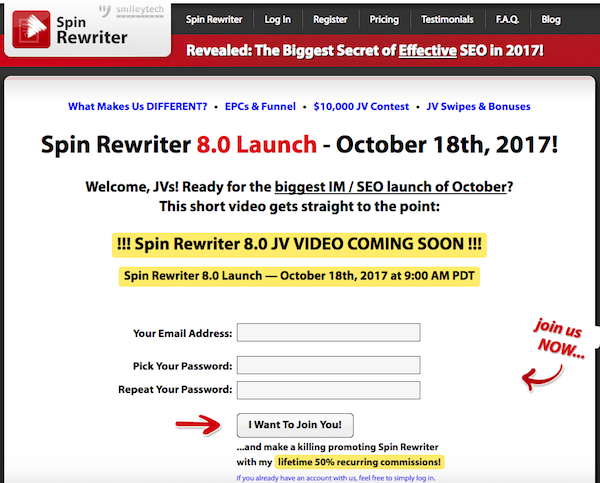 We’re REALLY looking forward to you joining us for the Spin Rewriter 8.0 launch. Once again we’ll be paying out 50% recurring (!) commissions, forever, on ALL payments in our entire sales funnel. Of course we’ll also be running a $10K+ JV contest on top of that, with a bunch of super tempting and fun prizes… go check them out. We’re all super excited about the 8.0 launch and would LOVE to have you on board. Click here to see how we’ll make this promo incredibly profitable for you, with tons of recurring commissions on October 18th, 2017. 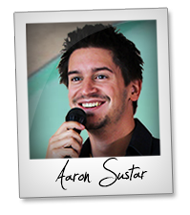 Proven High Ticket Launch = Big Affiliate Commissions … The Conversion Monster Is BACK! Reminder – 1 Million sold (without even a “launch”)! The Conversion Monster is back on September 12th … Get in on this invite-only commission-goodness! Greg Jacobs – Mage Omega X JV page. JVZoo Top Seller … The Real Guys Team! The Real Guys are joining forces yet again to deliver to the market one amazing offer that simply cannot be beat! Since 2011 they have served thousands of customers throughout the world! Eric Holmlund, Paul Counts + Jeff Wellman – Proven Profit Package JV page. JV with Funnel King Russell Brunson! The video is going LIVE on September 15th and I’m throwing a CRAZY big launch party online. Whenever someone follows your link and opts in, you’ll STICKY COOKIE that person and get commissions on ANY ClickFunnels product they buy in the future… PLUS, you’ll earn $1 for every optin through this funnel! Affiliate registration & training here => Russell Brunson – ClickFunnels Viral Video Launch Party Launch Affiliate Program Registration & Optional Free Affiliate Training Bootcamp JV page. Not Your Typical JVZoo Launch … Give It A Looksee! 5FigureDay was his PLATINUM HIT, but now Bryan Winters is back to outdo his 10,000+ MONTHLY member magnet with “DualSqueeze”, his all-new VIRAL list & income building BEHEMOTH! Get paid up to $300+ per month directly, and then watch as your referrals *continue* to make you money on AUTOPILOT. Click here to get set up => Bryan Winters – Dual Squeeze JV page. Join us from Sept 21st – Oct 4th for the launch of our brand-new coaching course!! The Virtual Coach Program, taught by Eben Pagan and a variety of expert coaches, will give your audience a comprehensive system to help build a coaching practice they truly love within 10 weeks. There will be solid commissions and HUGE prizes! JV with Multi-Award Winning SEO Blogger Matthew Woodward! Over $16 EPC Last Time & This Time It’s Even BETTER! I’m Award Winning SEO Blogger Matthew Woodward & I Want To Invite You To Promote My Premium SEO Training Certification With My Battle Tested 6 Figure Sales Funnel! Plus, I’m giving away an unlimited number of Tesla Model 3’s… Matthew Woodward – Insanse SEO Training JV page. JV with One of Michael Cheney’s Top Students! Ben Martin is going to make you a ton of easy moo-lah here – 100% commissions on the entire funnel of the “The Commission Code” launch as well as over $5,000 in cash prizes. Goes live Tuesday 3rd October, get started here => Ben Martin + Anji Long – The Commission Code JV page. Sam Buchalter, Anik Singal, Daven Michaels, Matt Clark + Jason Katzenback and other fellow JVNotifyPro 2.0 partners are waiting in the wings … keep your eyes on your Inbox, and follow the action in the JVNP 2.0 Premium VIP JV Announcement archives.